Published on May 16, 2010 in Culture, Elections, General T&T, People's Partnership, PNM, Politics, Protest and UNC. 3 Comments Tags: Andre Bagoo, Patrick Manning, Percy Villafana, Politics. WE ARE ALL familiar with the rough details of the incident involving 81-year-old pensioner Percy Villafana and Prime Minister Patrick Manning. But have people really analysed the significance of this incident properly? 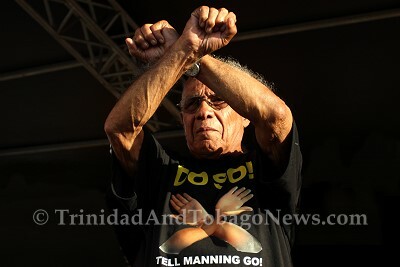 On March 15, Villafana was standing outside of his home at San Juan as Manning was conducting a PNM walkabout. Manning approached the pensioner and offered his hand for a handshake. The pensioner ignored him, keeping his arms crossed. “You’re not welcome here,” he told the Prime Minister. “I want nothing to do with you.” He attempted to keep Manning out of his yard. The Prime Minister ignored Villafana and walked into the yard of the house, shaking hands with children and greeting a woman in a gallery of the house. The Oxford English Dictionary defines a trespass as: entry to a person’s land or property without their permission. The archaic form of the noun means: “a sin; an offence”. It should be clear, that a person has a right – Constitutional or otherwise – to the enjoyment of their private property. Such a right is a right to exclusive possession of such property, to the prejudice of others who may want to enter. If someone does not shake your hand, that is no justification for a trespass. It is in this context that we must view the statements of Minister in the Ministry of Planning and Development Tina Grunland-Nunez and PNM candidate for Fyzabad Joel Primus who this month both lamented the dire practice that is now sweeping the nation of emulating Villafana’s “X” gesture. Joel Primus’ comments took asiNINE to whole new level. Can his comments now be considered ‘asiTEN’? Villafana, 81, told the Express in his low, gravelly voice, that since he stopped Manning some of his neighbours had been showing opposition. ’And as my popularity builds up, their actions become more and more noticeable,’ Villafana said. WHO SAID ONE PERSON CANNOT MAKE A DIFFERENCE. AT 81YRS. OF AGE SOMEONE DID. MR. VILLAFANA STOOD UP FOR WHAT HE BELIEVED IN “AND” HE DID MAKE A DIFFERENCE. IF YOU BELIEVE IN SOMETHING, “TAKE A STAND”. THAT IS WHAT FREEDOM IS ALL ABOUT. HATS OFF TO YOU MR. VILLAFANA, GOD BLESS YOU!!! !